Would you open this? 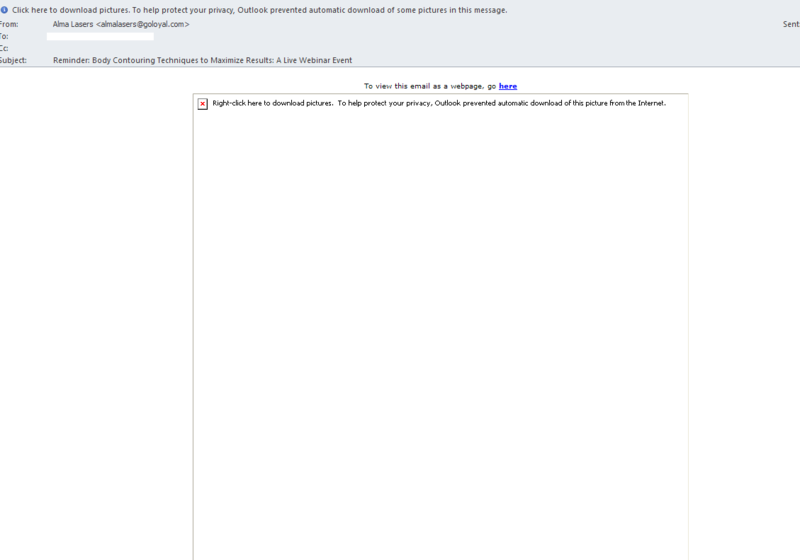 This example demonstrates why you don't send an email that has all the copy contained in an image. Nothing is conveyed other than the subject line. You've lost an opportunity to interest, educate and engage the reader. I wasn’t thinking that my first content post would be a condemnation, but it just irks me when I see bad marketing and simple mistakes made when we know better. Never send an email that is only an image. You may rationalize that the product is visually engaging and so by sending a picture, you capture the reader. Or that you’ve made a really pretty ad that you know works in print. That’s fine, and that may be true. If so, then include an image in addition to copy that is and can be conveyed as simple text. The problem with sending an image that has the entire piece captured in an image ( in order to maintain formatting and the attractive photos) is that nothing is conveyed unless you download the image. Nada. The program blocks the image in case it’s a virus or malware and so nothing is communicated. Most folks will simply delete it without bothering to accept the download or look at it online. People don’t care enough about your product or service to go the extra step unless they are already fans or engaged. If they are, then there is little need for these emails. But if you are trying to interest and engage new customers, you need to make it easy for them to learn about your products and to get the information quickly and effortlessly. That means understanding how people read their emails and how they digest them. It’s a mistake to minimize the opportunity for exposure. I’m talking about using an image as your ONLY means of communicating your messages in an email. While it looks pretty and I’m sure the layout and image is very engaging, if it hasn’t downloaded ( and many email programs and I would imagine mobile devices will not download an image automatically in order to protect against virus’ and malware,) you’ve lost your opportunity to convey any information. A good email will contain the most important messages as text only, so that if the image isn’t opened or downloaded, you get the most important information across, and perhaps persuade the individual the open the image and see the rest. This is doubly true in the mobile world. People can not see detailed images on their tiny little phone screens. You have to consider the various devices and locations where your audience will be viewing your messages. Marketers made these mistakes in the early days because we didn’t have the experience to tell us not to, but now there are so many articles and examples of what works to make it seem unforgivable to make such a simple mistake. Bottomline: Create emails with a combination of text and image to convey the most important points in text so that if the image is blocked or not downloaded, you still have communicated the salient information and made a productive contact. The journey of a thousand miles….